Project managers are the point person in charge of a specific project or projects within an organization. We regularly feature resources for project managers to help train PMs to land jobs in the industry or develop better skills in their current role. So we thought it would be a great idea to take a look at what core qualifications are required of project managers and define the common job descriptions for several PM roles. So what do project managers do? They plan, budget, monitor and report on the project with project management tools, sometimes pitching the idea of the project or being assigned to it once it’s already been approved. The project manager is the bridge between upper management and the teams tasked with the actual execution of the project. They make sure the scope of the project is sound, reporting regularly on the progress of the project and that it is staying on the approved schedule. > Give Your New PM The Best Tools For The Job. Try Our Award-Winning Software Free! Anything that has a start and a finish, resulting in a product, is a project and requires the oversight and leadership of a project manager. That means that project managers work in virtually all fields, from tech and IT to human resources, from advertising and marketing to construction, and everything in-between. Project managers are well-compensated for their work, and project manager salaries range around the low six-figures depending on title and location. Project management is a growing field, rife with opportunities for well-organized individuals. There are many entry points into work as a project manager. There is no one path, but there are more linear routes that one can take, just as if learning a trade. Being a project manager is a trade, after all, and there are many trade schools and universities that offer a course of study resulting in a degree. Beyond academia there is certification. There are two major certifying bodies, PRINCE2 and the Project Management Institute (PMI). The latter offers a certification called Project Management Professional (PMP), which has become the primary certification for professionals in the field of project management. But many people land as project managers without any education or certification in the field. While there is nothing wrong with getting educated and certified, experience is also a great teacher. Then there are those we called the “accidental project managers,” people who find themselves being tasked to lead a project and must hit the ground running. 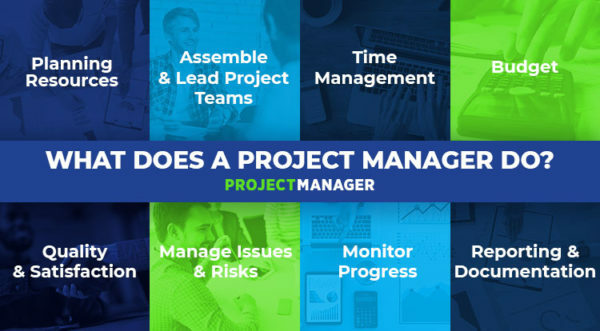 As noted above, there are different types of project managers. For example, there are construction managers. Typically, a project manager will have more authority and responsibility than a construction manager. While a construction manager is dealing with personnel and materials at the work site, as well as making sure the project is compliant with code and best building practices. Then there are program managers. They are like project managers, only their responsibilities go beyond one project. A program manager is managing a portfolio of usually related projects, which has its own unique requirements. There is a long list of what roles a project manager is responsible for over the life cycle of a project. These responsibilities, give or take depending on the organization and project, are universal. They apply to all project managers. Planning Project Resources: A project can begin and certainly is designed to fail if there first wasn’t a plan devised to see it through, on time and within budget. The project manager’s first role is making a feasible plan that achieves the goals and objectives of the project and aligns with the organization’s overall business strategy. This is not only a blueprint with which to run the project, but a critical part of the pitch to get approval for the project. Part of the plan is defining the project’s scope and determining what resources are available, estimating time and financial commitment, as well as how to monitor and report on the project’s progress. Assembling and Leading Project Team: Project managers need resources to complete the project tasks, which includes skilled and experienced workers. They need to either take a leadership role with an existing team or create one. Once a team is created, you assign them tasks and deadlines, give them the tools to collaborate and don’t get in their way by micromanaging every activity. Meet regularly, of course, and get status updates to chart their progress, while reallocate resources as needed to avoid blocking team members or overburdening them. Time Management: Time is always ticking towards the project deadline. While communications is key to addresses changes and make sure everyone is doing what they need to do when they need to do it, the project manager must also define, schedule and accurately estimate the task duration to develop and maintain a realistic schedule. Budget: Nothing is going to get done without money. Figuring out what the proper funding for the project is, having that get accepted and then keeping the project within or under that figure is often what makes or breaks a project. You can get your stakeholder their deliverables on time, but if that cost more than the budget you created, then the project is a failure. Making an accurate estimate is only the first part. Next, you must monitor the actual spend as compared to the planned budget. If those figures are off, you must adjust accordingly. Quality and Satisfaction: These are two major hurdles to clear. You want to deliver to your stakeholders what they expected or better and make sure that they’re satisfied with the results. But that doesn’t mean ignoring them to focus solely on the project. Rather, you need to be in constant communications with them, reporting on progress and being open to their feedback to keep them happy and coming back to you with future projects. Monitoring Progress: To make sure a project is progressing as planned, you must constantly measure it and compare those metrics against the plan you created. Therefore, you must have a way to collect project data, such as status reports from your team, to see if the actual progress of the project is meeting what you had initially planned. Things are going to change along the way, and you’re going to have to adjust or reallocate resources to accommodate these changes. If you’re not monitoring this, you’re managing in the dark. Reporting and Documentation: Reporting is one of ways you communicate with your team and stakeholders. While teams need more detailed information and stakeholders are looking for broader data to check the project’s progress, both are essential tasks for the project manager. This documentation, along with all paperwork, must be collected, signed off on and archived by the end of a project, which provides a history that you can revisit when planning for a similar project in the future. For your convenience, here are a general project manager, IT project manager and senior level project manager job descriptions that you can copy, paste and edit as necessary! An IT Project Manager is responsible for developing and managing technology projects and their cost, time and scope. Responsibilities include: project plan, communication plan, allocating tasks and setting milestone. Senior Project Manager is in charge of schedules, budgets, resources and deliverables for project. Monitors teams to make sure goals and objectives are being kept. Knowledge of larger landscape without neglecting granular details while tracking project health, staying alert for risk and resolving issues as they arise. Maintains standards and monitors scope with project quality. No matter what type of project you’re working on, project managers need tools to help them manage all the moving parts of their project. ProjectManager.com was developed by project managers for project managers. It’s a cloud-based tool that gives you real-time data to better monitor your projects, but also has features to help you plan, manage teams and report with ease. See for yourself by taking this free 30-day trial.